As has been widely reported, US President Donald Trump has announced his intention to withdraw from the Paris climate agreement. The President stated that the withdrawal was necessary, as Paris would “impose draconian financial and economic burdens on our country”, and “would leave American workers and taxpayers to absorb the cost in terms of lost jobs, lower wages, shuttered factories, and vastly diminished economic production”. Trump wants to negotiate a “fairer deal” either within the Paris framework, or separately. Many US companies, cities and states have reacted by reaffirming their commitment to honouring their emissions reduction targets regardless of the central government’s stance, while a recent Washington Post-ABC News poll showed that 59% of Americans oppose the move to withdraw from Paris. It is worth bearing in mind that formal withdrawal from Paris will not be possible for the US until 2020, by which time Trump will be up for re-election. US withdrawal from Paris is likely to have little impact on New Zealand, at least in the short term. According to Climate Change Minister Paula Bennett, “It’s really disappointing the US has chosen to withdraw from the Paris agreement, but New Zealand remains absolutely committed to it”. Meanwhile, as the National Fieldays open at Mystery Creek, DairyNZ has announced the “Dairy Action for Climate Change” - a plan developed for dairy farmers to cut their carbon footprint. DairyNZ will be working in partnership with Fonterra (with support from MfE and MPI) and will initially host workshops, facilitate training and promote climate change “champions”. More information can be found here. Greenpeace has been quick to respond to this plan, describing it as “all talk and no trousers”. More information on their viewpoint can be found here. 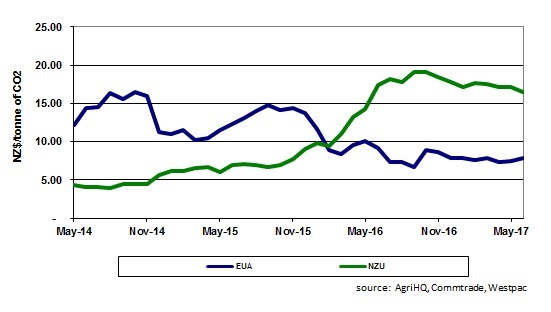 NZU prices have continued to stagnate around the $16.50 mark into June, as both buyers and sellers seem to remain relatively inactive. In general, forest owners with credits to sell have little interest at current pricing, and are holding out for improvement over the coming months.